At this point credit card debt in the U.S. is so common, the question isn’t if you’re in credit card debt—but how much credit card debt you have. A recent study shows that nearly 40% of all American households carry credit card debt. And in November of 2017, U.S. credit card debt reached $1.023 trillion, which is higher than it’s ever been. Not only do more Americans have credit card debt, but the amount of their debt is also higher than ever before. As of September 2017, the average credit card debt per household hovered around $15,654. So if you’re stuck with high credit card debt, you’re not the only one. Millions of Americans have the same problem. Annual healthcare costs were $10,348 in 2016. In 2006, the cost was $7,233. Between 2016 and 2017, food prices rose 8.2%. Many Americans have no choice but to take on debt just to meet their basic living needs. Add to that a sudden, unexpected expense or loss of income—like job loss, unforeseen medical bills, or divorce—and you have a recipe for financial ruin. While it’s extremely easy to get into credit card debt, getting out of debt could feel like an insurmountable challenge. Even if you are a master at budgeting and saving money, you may feel like your efforts aren’t making a dent in your credit card debt. Even if you are a master at budgeting and saving money, you may feel like your efforts aren’t making a dent in your credit card debt. Doing it all on your own can be tough, especially when you don’t know all of the options available to you. In order for you to make a plan to put your credit card debt behind you for good, you need to understand the most widely used ways to get out of credit card debt; including do-it-yourself methods and professional debt relief services like Freedom Debt Relief. Read on to learn more about these solutions as well as good habits that could help you stay out of debt. If you want to get out of credit card debt, the first thing you need to do is understand what credit card debt is and what credit card debt is not. Before diving into this topic, though, it’s important to define some terms that relate to credit card debt. Credit is the money that a person or organization is willing to lend to you with the expectation that you will repay them in the future. Credit can come in different forms, including loans and credit cards. Creditors are the people who lend you the money. Typically, this is a bank or financial institution. Terms are the length of time you have to repay your debt, the monthly amount you need to pay, your interest rate, and other stipulations you agree to when you accept the loan. Debt is the money you owe to your creditors after you accept a loan or pay with a credit card. Now that you know some basic terminology, it will be easier to understand how credit card debt works—and how to deal with it. When you take out an auto or home loan, the debt you owe is secured by the asset you bought. In other words, you have to make your payments on the loan every month or else your lender might come and repossess whatever you took the loan out for. That’s why a home loan, auto loan, or any other type of loan attached to an asset is referred to as either a secured debt or collateralized debt. On the other hand, credit card debt isn’t attached to any asset or collateral—which makes it unsecured or uncollateralized debt. Part of what makes credit cards so appealing is that you can use them to pay for almost anything. But the price you pay for that convenience is the interest rate. Since credit cards are unsecured debt that you can use however you want, there’s more risk involved in giving them to people. That’s why interest rates on credit cards are typically higher than other types of credit. Fixed interest rates are set when you first take out credit card, loan, mortgage, or any other kind of debt. The rate never goes up on fixed interest rate debt unless you are more than 60 days late on a payment, or if you signed up for a credit offer with a promotional period that has expired. If you have a fixed rate credit card, your creditor must give you a 45-day advance notice before changing your rate. During this time, you’re allowed to opt out of the new rate and pay off the balance at the old rate. Fixed rate debt can only increases for a handful of reasons, but the rate you get will be higher than variable rate debt. Just like the name sounds, variable interest rates can change over time. While variable rate debt could start lower than fixed rate debt, the interest rate could eventually increase over time. That’s because variable interest rates are based on two numbers—the prime rate, which is the lowest interest rate at which your lender will let you borrow money, and the margin rate, which is a number that your creditor decides on based on your credit profile and other factors. As the prime rate fluctuates over time, your margin interest will change, too. Your creditor doesn’t have to tell you when the prime rate increases because this number is set by the market. However, your creditor has to tell you before the margin rate increases on your variable rate debt, just like with fixed rate debt. Similar to fixed rate debt, you can opt to pay off the balance on your debt before your margin rate increases, but you will need to pay the new, higher rate moving forward if you continue using the card. No matter if you owe $1000 or $100,000, if you only make minimum payments, it could take you years to pay off your credit card debt and cost you a ton in interest. Say you have three credit cards and owe a total of $15,000 with an average fixed interest rate of 16.99% APR. If your minimum payments are 3% of the total amount you owe ($450), it would take you over 21 years to pay off the debt. To make things worse, during that time you will have paid over $13,000 in interest alone—spending a total of $28,140.41 on the $15,000 you borrowed. Do the math on your credit card debt and you’ll soon realize that making minimum payments is not a good way to get out of debt—especially when you consider the fact that you will likely keep using your credit cards, which will add more to your debt and make it even harder to get caught up on your payments. Do the math on your credit card debt and you’ll soon realize that making minimum payments is not a good way to get out of debt. Making minimum payments is very risky. It’s so easy to pay the lowest amount each month so you can have money for other expenses. But eventually, minimum payments trap you in a cycle of endless debt. Then, all it takes is one financial emergency and you’re in a hole that’s incredibly difficult to get out of. If you miss a single payment, you could incur late fees and drastic rate increases. And if you simply can’t pay your debt, you may be subject to collection calls and legal action that could cost you even more money. If you see yourself approaching this point, or you think you’re already there, it’s time to do something about your finances and get out of debt for good. The first step in getting out of credit card debt is knowing your options. While there are many debt solutions out there, not all of them will be right for you. Your decision will depend on your current debt, how soon you want to be out of debt, how much you can afford to pay, and other factors. You also have to weigh the pros and cons of each solution so that you understand what you’re getting into before you commit. Here are five of the most common and effective ways to get out of credit card debt. Using the Avalanche Method, you put all of your extra cash towards the card with the highest interest rate first. Once that card is paid off, you pay off the card with the next highest rate—and on and on until all of your credit cards have been dealt with. This method is a good way to pay off credit card debt if you have one or two cards charging you exorbitantly high interest rates. With this do-it-yourself debt solution, you find the card with the lowest balance first and pay it off. You continue down the line, paying off each card with the lowest balance until all of your debt is gone. This solution is ideal if you have a lot of credit cards and want an organized way to pay each one off faster. Summary: Making more than the minimum payments each month is always good choice, but it may not be the quickest solution if you’re struggling with $10,000 or more in high-interest debt. Unless you’re set on getting out of debt without anyone’s help, other solutions could be faster and less expensive. Both online lenders and banks offer personal loans that you could use for debt consolidation. After paying off all your outstanding debt using a consolidation loan, you make monthly payments to your loan provider until your debt is paid. Debt consolidation loans could simplify your payment schedule, get you a lower interest rate than you’re paying on your credit cards, and help you pay off your credit card debt in less time. But a consolidation loan could be hard to qualify for if you don’t have a great credit score, and your monthly payments may be higher than you’re paying right now. Typically, debt consolidation loans are a good option if you can get a low interest rate and terms that make your monthly payments affordable. With a balance transfer credit card, you could consolidate all of your credit card debt into a single credit card with a low promotion rate—often as low as 0%. While moving your debt to a card with a 0% rate might sound attractive, there’s usually a balance transfer fee, and the promotional rate only lasts an average of 16 months. Then, the card functions as any other credit card would, the rate goes back up, and you’re still on the hook for all the debt you didn’t pay off. If you can afford to pay off all of your credit card debt in a very short amount of time, balance transfer cards could be the right solution for you. But since most people wouldn’t have to struggle with credit card debt if they could afford to pay it off that fast, balance transfer cards could end up being a short-term solution for a long-term problem. Summary: Debt consolidation could help you get out of debt faster, save on interest, and simplify your payment schedule—but only if you qualify. Both balance transfer cards and debt consolidation loans require you to have great or excellent credit. If you’re struggling with a lot of debt and your credit has been affected, you may have a hard time getting the best rate and terms you will need to truly make this solution worthwhile. Learn about debt consolidation loans here. Find out if a load is right for you. Stuck paying high interest rates on debt you could otherwise afford? A credit counseling agency could help. These non-profit organizations work with consumers who need help with debt management, budgeting, and financial education. They also offer Debt Management Plans (DMP) to eligible clients who owe 15%-49% of their annual income in debt and have enough income to pay it off at a reduced interest rate. If you qualify for a Debt Management Plan, the credit counseling agency will negotiate lower interest rates with your creditors and set up a repayment plan for you to follow. After you pay money to the credit counseling agency each month, they pay your creditors on your behalf. This process continues until all of the debt is paid—typically lasting about 60 months. The interest rate reduction could be anywhere from 8%-25%, depending on the credit counseling agency, creditors, and other factors. Summary: While a credit counseling agency could help you reduce your interest rates and lower your monthly payments, you’ll still have to pay the principal of your debt if you enroll in a Debt Management Plan. This solution could be right for you if your biggest struggle in paying off your credit card debt is the high interest rates. Looking for a credit counseling agency? Learn how to find one here. When it comes to paying off debt on your own, a little known secret could get you out of debt for less. Believe it or not, your debt is negotiable. If you can show that you’ve been through a financial hardship that makes you unable to pay your credit card debt, your creditors may work with you to reduce your interest rate, change the amount you owe each month, or even forgive for part of your debt. Negotiating with your creditors could be a challenging and time-consuming process. But if they are willing to work with you, you could be out of debt much faster and for less than any of the methods above. If you can show that you’ve been through a financial hardship that makes you unable to pay your credit card debt, you may be able to settle your debt for less. Find your creditor or debt collection agency’s contact information. If you are behind on payments, your creditor may have sold or transferred your debt to a collection agency—so make sure you know how to contact the right company. Create a repayment proposal. Write out a repayment plan that you can actually afford. Include the new debt amount, interest rate, and monthly payment in your proposal. Discuss your plan with your creditor. See if your creditor will accept your debt reduction proposal. If they do, make sure they sign a new contract based on the agreement. Pay your debt according to the agreement. Negotiations are only valid if you pay your creditor according to your agreement. You can pay creditors in a lump sum, or over a period of time—but if you miss even one payment, your agreement could be null and void. Summary: Negotiating with creditors on your own is possible, although there’s no guarantee they’ll agree to your proposal. Even if one creditor accepts your debt reduction plan, you may have trouble getting all of your creditors to reduce your debt. That’s why many people choose to hire professional debt negotiation companies like Freedom Debt Relief to negotiate settlements on their debts for them. 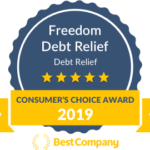 Negotiating with creditors on your own can be a long and painful process, which is why companies like Freedom Debt Relief offer to do it for you. If you’re struggling with over $7,500 in credit card debt and can’t see a way out, we could negotiate with your creditors and settle your debt for less. With over 15 years of experience working with creditors, we have the insight and expertise to get you significant reductions on your debt so you could be debt free as quickly as possible. Get out of debt for less. We work with creditors with the goal of getting them to forgive a large portion of your debt. Save more each month. We create an affordable plan with monthly deposits that could be even less than you’re paying right now. End your debt stress. When you get professional debt help, you could stop worrying about debt so much. As the largest debt negotiator in the U.S., we have resolved over $9 billion in credit card debt for our clients since 2002—and we could help you, too. Request a free debt evaluation to find out how much our program could help you could save on your debt now. Summary: Freedom Debt Relief offers an affordable debt solution that is not a loan and does not require you to have a great credit score. If you are dealing with credit card, personal loan, or medical debt because of a financial hardship, you could qualify for our program, which could help you become debt-free faster and for less. Find out how our program works. Think about your spending patterns. Sometimes you have no choice but to get into credit card debt, especially if you lose your job, have medical expenses, or get hit with other major unexpected expenses. But, if your reason for getting into debt was your spending habits, it’s a good idea to re-evaluate how you spend money so that you can avoid credit card debt in the future. Pay in full each month. It’s tempting to fall back into the habit of paying the minimum or less than the full amount each month, but that’s a slippery slope. Make it a rule to pay back what you owe on your cards every month, no matter what. This will help curb your spending and control the temptation to use your card on things you don’t really need. Only use credit cards when it makes the most sense to. This tip goes hand in hand with paying in full each month. Don’t be afraid to use your card if it makes sense, like if you’re shopping online or you need to hold a reservation. And don’t feel you need to shy away from rewards cards that give you cash back, points, or airline miles—as long as you’ll actually cash in on the rewards. No matter what you charge on your credit cards, just make sure you pay it off in full every month. Build up a rainy day fund. The best way to stay out of credit card debt is to be ready when an unexpected expense happens. That’s why it’s important to start an emergency fund in case you need to pay for a hospital visit, a mechanic, home repairs, or another sudden expense. Being proactive and saving even $50 or $100 every month could help you avoid getting into credit card debt in the future. If you budget, spend wisely, and follow these tips, you could stay out of credit card debt for good. Hopefully you feel more in control now that you know the most popular methods of getting out of credit card debt. It’s important to remember that your credit card debt doesn’t define you, and you do have the power to overcome it. By researching how to get out of credit card debt, you are already taking an important step towards ending your debt. If you still have questions or need more details about getting out of debt, you can always download our free debt guide to learn more about your debt relief options. Or, if you want someone to walk you through your options over the phone, call 800-230-1553 to speak to one of our Certified Debt Consultants for free. You can get out of debt, and Freedom Debt Relief could help. Request a free debt evaluation and start on your path to debt freedom today.